Shooting guests arriving an hour before the ceremony starts until all guests leave for the reception. 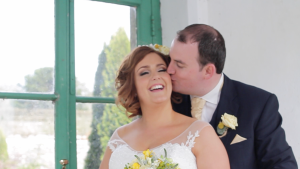 Highlights Film and Main Wedding Film delivered on USB drive and Google Drive for sharing with family and download. Shooting for roughly an hour before the guests arriving until the end of the speeches before the meal. Shooting all the bridal preparation on the morning of the wedding up to the end of the speeches before the meal. 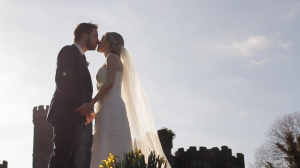 Highlights Film and Main Wedding Film (Aprox. 2 hours) delivered on USB drive and Google Drive for download and sharing with family. The complete package shooting the whole day from bridal preparations up to the 5th 6th dance at the reception. Highlights Film and Main Wedding Film (Aprox. 2-3 hours) delivered on USB drive and Google Drive for download and sharing with family. A meal is required on the day if the speeches are after the meal and or I am shooting the first dance. Wedding Films deliver with 2 months. 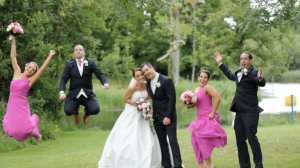 Bespoke streaming page to share your wedding films with family & friends. Drone aerial footage + €200 extra. It is presumed that speeches are before the meal if they are after the meal this adds another 2 hours to the package. Deposit of €100 is required at the time of booking. The balance of the final price is paid on the morning of the wedding. make your Wedding Day unique. There are NO staged shots whatsoever. None! You and your guests can relax and forget that I am even even there.